-Statement Released by Suaram, October 8, 2012. William Bourdon (SUARAM’s lawyer) said: Yves Charpenel statement (is) absolutely contradictory with the current investigations. The Tribunal deGrande Instance has convened a criminal inquiry of which SUARAM has been accepted as a civil party since March 2012. Upon completion of the inquiry will the investigating judge make the decision of whether the case goes to full trial. Its the investigating judge that makes the decisions not the prosecutor. To our knowledge the current prosecutors in charge of the case have not made any such statements as suggested by Charpenel. 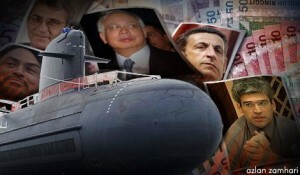 The two Judges, Roger Le Loire and Serge Tournaire continue their investigations on the Scorpene inquiry”.